Banff and Jasper are the two most visited national parks in Canada, with good reason, but don’t be remiss if you think they are the only two in the Canadian Rockies. It’s quite incredible the amount of protective wilderness there is in the surrounding area. From Lake Louise, you can head west on Highway 1, quickly crossing into British Columbia and into Yoho National Park. The park is filled with history and innovation with points of interest along the way as the road weaves in and around the mountain pass. You can spot the Spiral Tunnels, which is a unique design to help the Canadian railway system make passage through the mountains. As well as the Burgess Shale, which is known to be one of the most important fossil discoveries in the world. Access to the site is from Emerald Lake, the largest lake in the national park. Take the Emerald Lake Road just outside of Field, BC and follow the path until you reach the parking lot along the lakes edge. We had trouble finding parking, due to the limited parking spaces. The Emerald Lake Lodge offers patio dining and four-star accommodations. Canoe rentals are available, as well as a trail that leads you around the magnificent body of water. Yoho is home to 250 miles of hiking trails leading to many more beautiful vistas, lakes and waterfalls. It’s known to offer the best hiking in Canada. I suggest visiting Takakkaw Falls (1,260ft), the tallest waterfall in the park and the third tallest in western Canada. It’s a couple miles off Highway 1, down Yoho Valley Road, but a scenic drive along the turquoise river. Keep in mind that the road is closed from October to June. In the summer, there are campgrounds available and the Cathedral Mountain Lodge along the river that makes for a nice basecamp for exploring the park. Lake O’Hara is known to be one of the most spectacular sites in the country, and can be accessed by a park bus at the parking lot along O’Hara Park Road. For any overnight trips, you can reserve a space at the lake campground, stay at the Elizabeth Parker Hut or the Lake O’Hara Lodge. Continuing along Highway 1, you’ll drive through the town of Field and eventually out of the park and into Golden, British Columbia. Situated between the Columbia and Rocky Mountains, Golden is in a prime location for all of your outdoor activities. Six national parks are with in driving distance, Banff, Jasper, Yoho, Kootenay, Glacier (B.C.) and Mount Revelstoke. The town itself has some great shops, restaurants and home to Whitetooth Brewery. There’s a municipal campground, a few hotels and Kicking Horse Mountain Resort – renowned for some of the best snow and powder conditions in the world. Once the snowmelts, premiere white water rafting, mountain biking and hiking are at your fingertips. If you have the time or decide to keep heading west, Glacier (B.C.) and Mount Revelstoke National Parks are hidden gems. 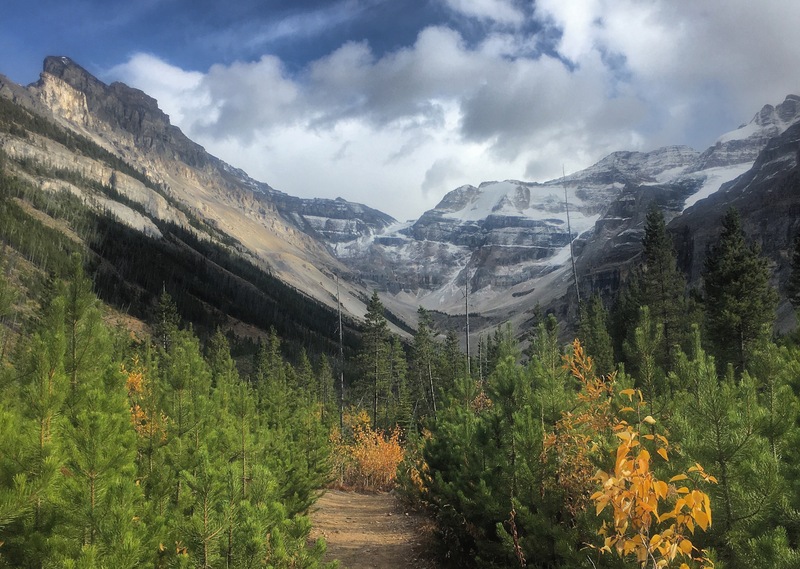 However, if you are staying in the Rockies, you can head south and take an hour-long drive to Kootenay National Park – the route that we chose and the continued loop around the Canadian Rocky Mountain Parks. As you approach the west entrance of the park, you’ll come to the village of Radium Hot Springs – home to one of British Columbia’s top natural hot springs. Radium is a family friendly facility that offers plenty of space to relax and rewind. The drive through the park is only about 60 miles and connects back to Highway 1 into Banff National Park. The great thing about Kootenay is that it has all the glaciers, canyons and mountain vistas that the other parks have to offer, but the crowds are a little scarcer. It only took us about 90 minutes to drive through the park, stopping at a few points of interest. At the far end of the park, we reached a trailhead for Spencer Glacier – suggested to us by a park ranger. It was probably one of the most unique hikes I’d done because it’s known as the “valley of fire and ice.” When I say this, I literally mean it. The first section of the 2.5-mile hike is through a forest that’s been scarred by fires, rising into the hanging glacial valley. The last portion is more technical, traversing over rocks and boulders with the snow covered peaks standing tall above you. By the time we reached the tundra, it was an incredible view of the glacier, well worth the climb. After our descent down, we took the short drive back into Alberta and merged back on to Highway 1. From there, you can continue on into Banff and take in all the beauty surrounding the tourist town. I viewed Banff more as a posh and ritzy ski town, with elegant shops and restaurants, filled with patrons from all around. Beautiful, no doubt, with the surrounding peaks and chilled mountain air, but we removed ourselves from that money pit quickly. Maybe one day we’ll return to ski their snowy slopes, but what I look forward to the most is getting back to Golden, BC and exploring more of the surrounding national parks.